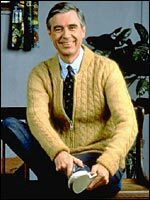 "Won't You Be My Neighbor" was written in 1965 by Fred McFeely Rogers, better known as Mr. Rogers. He was an American educator, Presbyterian minister, songwriter, author, and television host. His daily television show, Mr. Rogers' Neighborhood, began with this simple song that made children feel that they were part of a special place where they would always be welcomed. The words and the music to "Won't You Be My Neighbor" have a charm that still gives warmth and peace to anyone who hears it. Sing along to this performance by the bears at The Teddy Bear Monastery. I've have always wanted to have a neighbor just like you. Won't you please? Won't you please?